Born August 27, 1957 and accepted Christ as his personal Savior in the summer of 1969 at Atlanta, Georgia, while his father was pastor of the Rocky Head United Methodist Church. He accepted his call to preach in 1983, preaching his initial sermon the 3rd Sunday in August of that year at the Wilson Chapel African Methodist Episcopal Church. He was admitted to the West Tennessee Annual Conference in October, 1984. Assigned to supply Spring Chapel AME Chapel in Grand Junction, Tennessee in October 1985, with the permission of the Presiding Elder (J.C. Miller) he went on to reopen Euwell Chapel AME Church in Moscow, Tennessee preaching at Spring Chapel the first and third Sunday and every Sunday afternoon at Euwell Chapel, he proved to be successful at both charges. In October 1986, he was elected an Itinerant Deacon in the West Tennessee Conference at Quinn Chapel AME Church in Paris, TN. At the request of the Presiding Bishop (The Rt. Rev. C. E. Thomas) his ordination was delayed to become a part of the celebration of the Bi-Centennial of the African Methodist Episcopal Church in Philadelphia, Pennsylvania; thus, he was ordained an Itinerant Deacon in June 1987; in the meanwhile he was transferred to the West Kentucky Conference and assigned to St. Paul AME Church in Louisville, Kentucky in November 1986. He was elected and ordained an Itinerant Elder in the West Kentucky Conference in 1988 at Burks Chapel AME Church in Paducah, Kentucky at the hand of the Bishop C.E. Thomas. It is significant to note that at both the sites in which the Reverend Golphin was elected for ordination (Quinn Chapel, Paris, TN and Burks Chapel, Paducah, KY), he would later become pastor. In addition to the aforementioned assignments, Reverend Golphin has been blessed by God to pastor the following Churches: St. James AME Church — Mayfield, Kentucky (November 1989-1991); Asbury Chapel AME Church — Louisville, Kentucky (1991-1993); Burks Chapel AME Church — Paducah, Kentucky (1993-1998); St. Paul AME Church — Versailles, Kentucky (1998-2006); Perkins Chapel AME Church — Wilmore, Kentucky (2002-2005); Quinn Chapel AME Church — Paris, Tennessee (January 2006-November 2006); Historic St. Paul AME Church — Lexington, Kentucky (2006-2007); Presiding Elder of the Lexington District, Kentucky Annual Conference (2007-2010); Asbury Chapel African Methodist Episcopal Church, Louisville, Kentucky (2010-2013); Youngs Chapel African Methodist Episcopal Church — Louisville, Kentucky (2013-2014); and now the proud Pastor of Quinn Chapel African Methodist Episcopal Church — Lexington, Kentucky! As a student at Asbury College, he has had various continuing education courses and he is a graduate of Asbury Theological Seminary - Wilmore, Kentucky (December 2005) with a Master of Arts of Christian Leadership. He is the recipient of numerous awards and a member of several Community boards and organizations, including the office of Christian Director, Secretary and Trustee in Denominational Ministries. The Reverend Kenneth Jerome Golphin is married to the former Dianna Brown (January 1982) and is the proud father of four children — Chastity, Kendra, Chauncey, and James. He has an impressive Pastoral career, having served on countless Community Boards and Organizations; and Denominational Ministries. He is the recipient of numerous awards such as: Distinguished Citizen of Mayfield, Paducah and Louisville, Kentucky; Kentucky Colonel; Captain of the Belle of Louisville; Duke of Paducah, Kentucky; and Outstanding Leadership Award. Bishop Jeffrey N. Leath appointed the Reverend James "Book" Smith as Presiding Elder of the Lexington District - Kentucky Annual Conference in September of 2014. Bishop Leath is a child of the parsonage. He was born in Huntington, New York and has lived in Norwalk, Connecticut and Inwood, New York as his father served in those places. Dr. Leath is a graduate of Yale College, Yale Divinity School (Master of Divinity) and United Theological Seminary (Dayton, Ohio) - Doctor of Ministry. His doctoral dissertation focused on the Class Leader system in the A.M.E. Church. Bishop Leath has served churches in New York; Rhode Island; Norristown, Pennsylvania and Wilmington, Delaware. His final pastoral charge was at Mother Bethel Church (Philadelphia) where he served for fifteen years as the 51st pastor. The Rt. Reverend Jeffrey N. Leath was elected and consecrated the 128th Bishop of the African Methodist Episcopal Church in July 2008 in St. Louis. 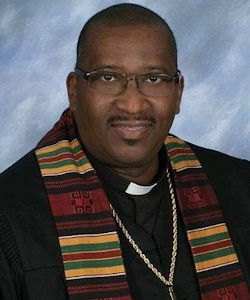 In his episcopal ministry, Jeffrey Leath served in the 19th Episcopal District (South Africa) during 2008-2012, and he presently is the presiding bishop of the 13th Episcopal District (Kentucky and Tennessee). 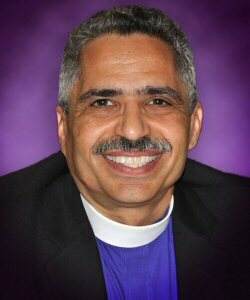 Bishop Leath is the husband of Susan J. Leath, M.D. ; the Leaths have three children: (the Rev.) Jennifer, Victoria, and Jeffrey, II. Brother Leath is a member of Alpha Phi Alpha Fraternity, and he is a 33rd Degree Prince Hall Mason.